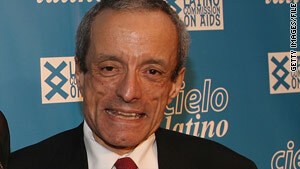 Dennis deLeon, long-time AIDS activist, died at the age of 61. He was HIV positive. The Latino Commission called him a "pioneer," "tireless advocate for social justice"
Commission president: "It will be a challenge to pick up the mantle Dennis has left for us"
New York (CNN) -- Dennis deLeon, former New York City human rights commissioner and long-time AIDS activist, has died, according to the organization he helped launch. He was 61. The Latino Commission on AIDS issued a news release Monday, saying that deLeon was a "pioneer" and a "visionary," as well as a "tireless advocate for social justice and one of the first openly HIV-positive Latino leaders in the country." New York Mayor Michael Bloomberg praised deLeon on Monday, saying in a statement that the activist "demonstrated a lifelong commitment to public service." After being appointed as the director of the mayor's Commission on Latino Concerns in 1986, deLeon went on to serve in other civic roles, including being selected by then-Mayor David Dinkins in 1990 to head the New York City Commission on Human Rights. In 1994, he returned to the private sector and helped found the Latino Commission on AIDS, where he served as its president for 15 years. According to its Web site, "The Latino Commission on AIDS is a nonprofit membership organization dedicated to fighting the spread of HIV/AIDS in the Latino community." "It will be a challenge to pick up the mantle Dennis has left for us at the Commission. Dennis was a friend, a mentor and an example of what a national leader should be. ... His work and his dedication to our community will not be forgotten," said Guillermo Chacon, current Latino Commission on AIDS president, in the release.